Taking selfies (or pictures of oneself) has become so ubiquitous that we no longer bat an eye at seeing a teenage girl making duck lips and snapping a picture of herself in any setting. 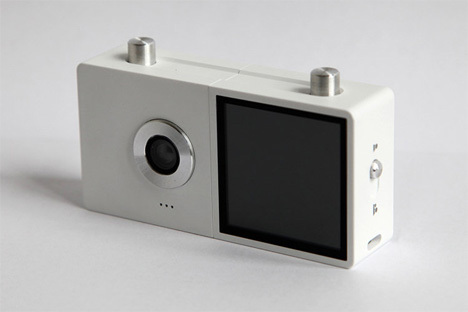 The Duo camera helps people take selfies in kind of a new way: with a two-piece camera. The Duo, designed by Royal College of the Arts graduate Chin-Wei Liao, consists of two identical cameras which are easily separated. When the shutter button is pushed on either camera, both simultaneously take a picture. The images are instantly displayed on the cameras’ screens as a stitched-together pic. If selfies are your only goal, you can easily set one camera up at a flattering angle and distance and use the second as a remote shutter button. However, there are some much more fun applications possible. Keep a camera and give one to a friend and see what kind of goofy, unexpected combinations of facial expressions emerge. Liao is still refining his concept, but he hopes to eventually use it to create an interactive performance piece between strangers.